Die Veneris, 2° Martii 1832. Logan et al. v. M. & J. Wienholt. Foreign Gloves, Petition from Yeovil against Importation of. Gloves & Kid Skins, &c. Account respecting, Ordered. Factories, Petition from Maidstone for regulating the Hours of Labour in. Orders of the House, Motion respecting, made & withdrawn. St. Luke's (Middlesex) Improvement Bill. Ds. Howden. March. Lansdowne, Præses. With a Bill, intituled, "An Act for diverting, altering, repairing, maintaining and improving the several Turnpike Roads within the District of Newport, in the County of Monmouth;" to which they desire the Concurrence of this House. With a Bill, intituled, "An Act for consolidating and amending the Laws relative to Jurors and Juries in Ireland;" to which they desire the Concurrence of this House. Plans, detailed Estimates and Contracts relative to the proposed Alterations at Buckingham Palace; the Plans distinguishing between the Works already done and the proposed Alterations." 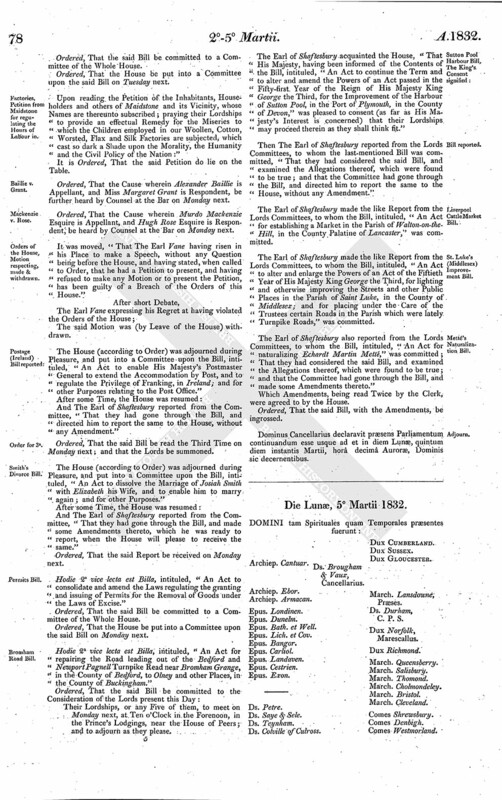 "An Account of all Additions which have been made to the Annual Charge of the Public Debt by the Interest of any Loan that hath been made, or Annuities created, subsequent to the passing of an Act 27 George 3, C. 13, and also showing how the Charge incurred in respect of the same has been provided for, in the Year ended 5th January 1832:"
Also, "Copy of Warrant for paying to Robert Threshie, Commissary Clerk of Dumfries, Compensation for Loss of Emoluments, under the Statute 4th George 4, Cap. 97, for the Year to 31st December 1831:"
Also, "Copy of Warrant for paying Colin Dunlop Donald, Commissary Clerk of Lanarkshire, Compensation for the Loss of Fees and Emoluments sustained by him through the Operation of the Statute 4 Geo. 4, Cap. 97, for the Year to 31st December 1831:"
And also, "Copy of Warrant for Payment of the Sum of Compensation due to Mr. George Carphin, Commissary Clerk of Edinburgh, for the Loss of Fees and Emoluments sustained by him through the Operation of the Statute 4 Geo. 4, Cap. 97, for the Year 1831." Ordered, That the Papers relative to Buckingham Palace, with the Exception of the Plans, be printed. Upon reading the Petition of the Glove Manufacturers of Yeovil, in the County of Somerset, whose Names are thereunto subscribed; praying their Lordships "to return to the Prohibition of the Importation of Foreign Gloves, as the only adequate Remedy for the Petitioners present calamitous Condition:"
Ordered, That there be laid before this House, "An Account of the Quantities of Gloves, and of Kid and Lamb Skins, respectively imported, of the Quantities taken for Home Consumption, and of the Quantities exported, expressing whether exported from Warehouse or otherwise, from the Year 1820 to the 5th January 1832, both inclusive." 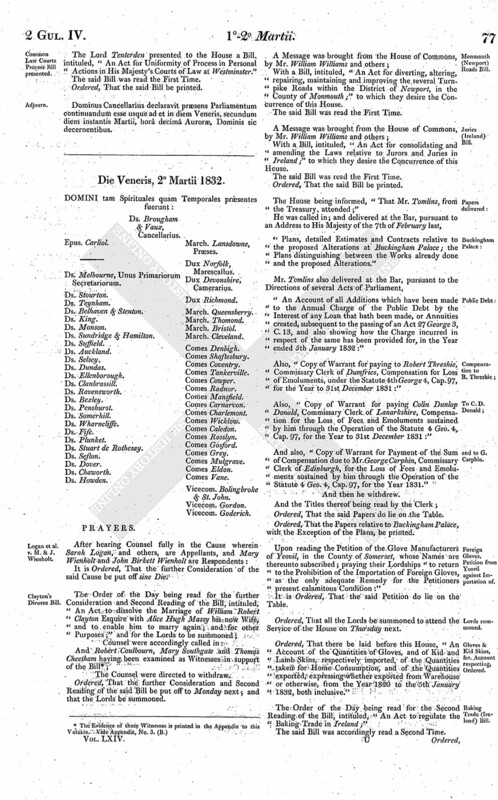 The Order of the Day being read for the Second Reading of the Bill, intituled, "An Act to regulate the Baking Trade in Ireland;"
Upon reading the Petition of the Inhabitants, Householders and others of Maidstone and its Vicinity, whose Names are thereunto subscribed; praying their Lordships to provide an effectual Remedy for the Miseries to which the Children employed in our Woollen, Cotton, Worsted, Flax and Silk Factories are subjected, which cast so dark a Shade upon the Morality, the Humanity and the Civil Policy of the Nation:"
Ordered, That the Cause wherein Alexander Baillie is Appellant, and Miss Margaret Grant is Respondent, be further heard by Counsel at the Bar on Monday next. Ordered, That the Cause wherein Murdo Mackenzie Esquire is Appellant, and Hugh Rose Esquire is Respondent, be heard by Counsel at the Bar on Monday next. It was moved, "That The Earl Vane having risen in his Place to make a Speech, without any Question being before the House, and having stated, when called to Order, that he had a Petition to present, and having refused to make any Motion or to present the Petition, has been guilty of a Breach of the Orders of this House." The House (according to Order) was adjourned during Pleasure, and put into a Committee upon the Bill, intituled, "An Act to enable His Majesty's Postmaster General to extend the Accommodation by Post, and to regulate the Privilege of Franking, in Ireland; and for other Purposes relating to the Post Office." Ordered, That the said Bill be read the Third Time on Monday next; and that the Lords be summoned. The House (according to Order) was adjourned during Pleasure, and put into a Committee upon the Bill, intituled, "An Act to dissolve the Marriage of Josiah Smith with Elizabeth his Wife, and to enable him to marry again; and for other Purposes." Hodie 2a vice lecta est Billa, intituled, "An Act to consolidate and amend the Laws regulating the granting and issuing of Permits for the Removal of Goods under the Laws of Excise." Hodie 2a vice lecta est Billa, intituled, "An Act for repairing the Road leading out of the Bedford and Newport Pagnell Turnpike Read near Bromham Grange, in the County of Bedford, to Olney and other Places, in the County of Buckingham." The Earl of Shaftesbury acquainted the House, "That His Majesty, having been informed of the Contents of the Bill, intituled, "An Act to continue the Term and to alter and amend the Powers of an Act passed in the Fifty-first Year of the Reign of His Majesty King George the Third, for the Improvement of the Harbour of Sutton Pool, in the Port of Plymouth, in the County of Devon," was pleased to consent (as far as His Majesty's Interest is concerned) that their Lordships may proceed therein as they shall think fit." Then The Earl of Shaftesbury reported from the Lords Committees, to whom the last-mentioned Bill was committed, "That they had considered the said Bill, and examined the Allegations thereof, which were found to be true; and that the Committee had gone through the Bill, and directed him to report the same to the House, without any Amendment." The Earl of Shaftesbury made the like Report from the Lords Committees, to whom the Bill, intituled, "An Act for establishing a Market in the Parish of Walton-on-theHill, in the County Palatine of Lancaster," was committed. The Earl of Shaftesbury made the like Report from the Lords Committees, to whom the Bill, intituled, "An Act to alter and enlarge the Powers of an Act of the Fiftieth Year of His Majesty King George the Third, for lighting and otherwise improving the Streets and other Public Places in the Parish of Saint Luke, in the County of Middlesex; and for placing under the Care of the Trustees certain Roads in the Parish which were lately Turnpike Roads," was committed. The Earl of Shaftesbury also reported from the Lords Committees, to whom the Bill, intituled, "An Act for naturalizing Echardt Martin Metté," was committed; That they had considered the said Bill, and examined the Allegations thereof, which were found to be true; and that the Committee had gone through the Bill, and made some Amendments thereto." Dominus Cancellarius declaravit præsens Parliamentum continuandum esse usque ad et in diem Lunæ, quintum diem instantis Martii, horâ decimâ Auroræ, Dominis sic decernentibus.